UPMC’s Finance Management Rotation (FMR) program is a three-year, immersive leadership development program that provides participants with three one-year rotations in various areas throughout finance and accounting. We asked three current Finance Management Rotation (FMR) participants, Katie, Ryan, and Steve, to share how they have grown as young finance and accounting professionals after participating in the program. Thinking of applying for the FMR program? 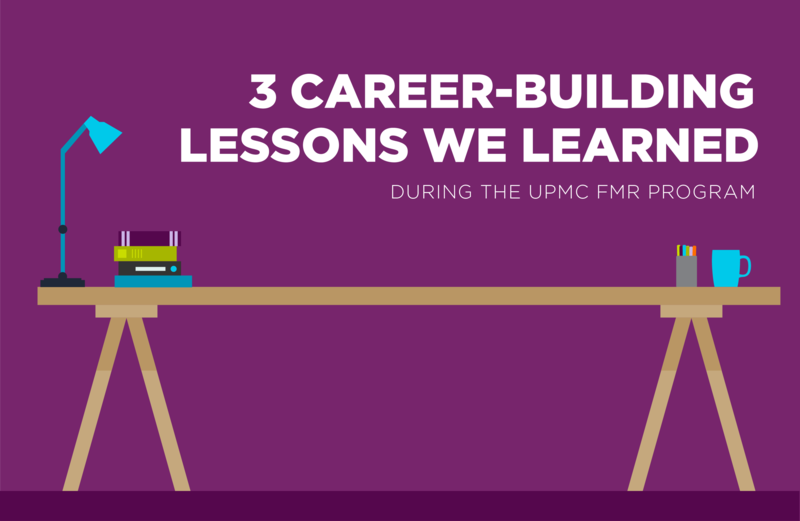 Get the inside scoop about what participating in the UPMC FMR program is like, and use the lessons these three participants learned to get a leg up! RYAN: Always be willing to learn, try new things, and absorb new knowledge — like a human sponge! Don’t be afraid to ask questions or suggest new ideas. In order to fully take advantage of each rotation, you must ask questions to help understand the scope of what you are working on. Create learning opportunities for yourself, and don’t be afraid to dive in! STEVE: Graduating from college doesn’t mean the learning stops, especially when it comes to being in a rotational program. Every FMR gets a new opportunity every year to learn about a different department within the Finance Division of UPMC. As a result, you’re exposed to new systems and procedures that you’ll be able to take throughout your UPMC career. So soak it all up — it’ll benefit you for many years to come! KATIE: As an FMR there are plenty of situations that can become discouraging at first. For me, I found it frustrating that every time I finally seemed to master a report or a new system, I had to move on to my next rotation! But as the saying goes: hindsight is 20/20. While it is sometimes very hard to make yourself realize it, I was learning an extremely valuable skill in all these times of transition: adaptability. Adaptability aids your career in the long-run, whether you’re switching departments, getting promoted, or learning about new members of your existing team. RYAN: As an FMR, you will have the opportunity to go through three different rotations and work on numerous projects. Be open-minded, listen, and take on new projects, if you are able to. Push yourself to your personal limit and never be content with mediocrity. Always strive for success and do your best to be a top performer for your department and UPMC as a whole. In the three years of the program, you will most identify areas that you excel at and enjoy. Upon completion of the program, you will have already had some guidance towards which direction you would like your career to go. STEVE: Communication is key when working within a large organization of over 65,000 employees. FMRs will work with a large variety of groups (Physicians, Surgeons, Nurses, Supply Chain, Finance etc. ), and it’s imperative that you develop your communication skills so that you’re able to communicate with others clearly, effectively, and efficiently. KATIE: In the FMR program, you are given an incredible amount of resources, but PEOPLE are your best resource. That’s why communication, as Steve said, is key! There are many FMR graduates that went through the exact situations that you find yourself in, and there are also great mentors in every department. Whether it be using a peer or reaching out to a mentor figure, these figures can help you to navigate through a problem and seek out an individual somewhere else within the company that may have the right answer. However, they are also valuable tools if you find you are encountering a tough situation at work or in your personal life. No matter where you are at UPMC there is always someone that is willing to help if you speak up! RYAN: As an FMR, it is your responsibility to take the initiative to utilize the countless resources (AKA-people) available to you! Find a mentor to bounce ideas off of, ask questions to, and to learn from on a daily basis. I cannot stress enough how important it is to build and maintain relationships in a professional setting. As an FMR, the exposure to individuals at all organizational levels is vast. So speak up! There you have it—become a sponge, stay positive, and speak up; these are the lessons our time at UPMC taught us, and they can guide you on your own career journey! Interested in becoming a #UPMCFMR? With a full-time salary and full-time benefits, you will gain high-level exposure to all of our executives and gain valuable industry experience while you’re at it! Upon completion of the program, graduates are highly sought after for complex roles across the organization. Learn more about UPMC’s FMR program.